Although widespread throughout Western and Central Europe this orchid is rare in the UK, where its few remaining locations are restricted to Kent, the Late Spider-orchid is protected and the sites managed to ensure its survival in the wild. 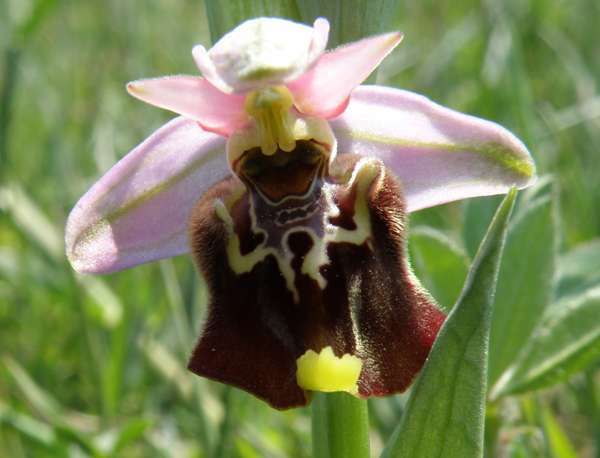 In some European countries this orchid is called Ophrys episcopalis. This orchid grows to between 10 and 50cm in height and each plant carries up to 10 large flowers. The petals and sepals are pink with green markings. The lips of the flowers are particularly distinctive and are large and square with complex speculums which stand out against the dark brown velvety backgrounds. The Late Spider-orchid is found throughout western and central Europe but is in steep decline throughout much of its range due to habitat destruction. This orchid grows in calcareous soils only, and it does not like tall, rank grass. Where it is proctected and its sites are managed, the grass must be mown or grazed appropriately. In the wild in other parts of Europe it appears in dry-to-moist conditions in short grassland, garrigue, abandoned farmland, open woodland and scrub. The flowers of Ophrys fuciflora are very large and showy. 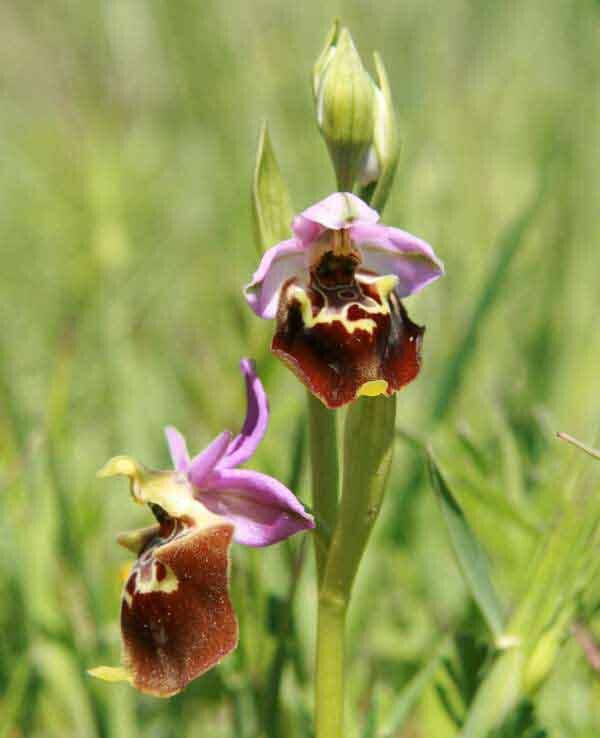 In the UK this plant flowers at the end of June and into the beginning of July - much later than the Early Spider-orchid - Ophrys sphegodes - which flowers in April and May and can be found on the Dorset coast. In other warmer parts of Europe the plants are more likely to be found flowering at the same time. 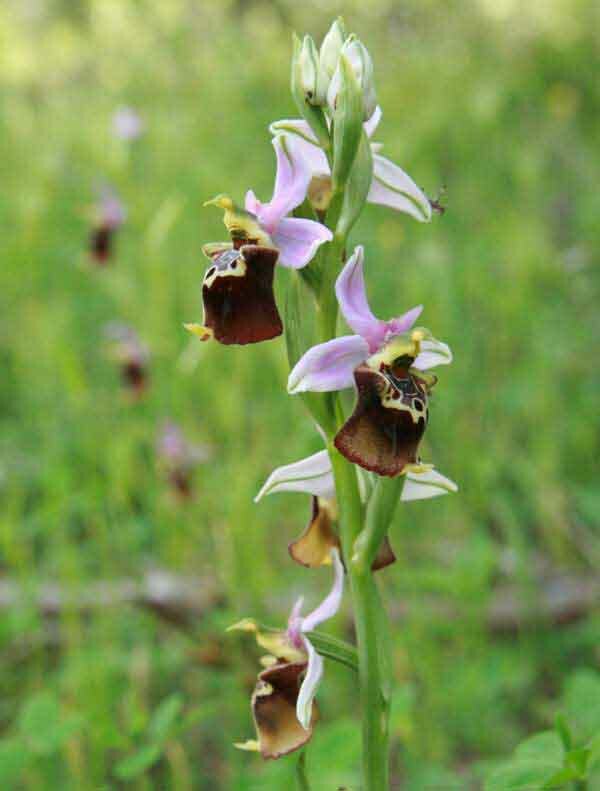 The flowers of the two plants bear little resemblance to each other despite their similar English names: the lip of Ophrys fuciflora is much squarer and reminiscent of the flower-shape of the Sawfly Orchid - Ophrys tenthredinifera - which also flowers in much the same places and at the same time in southern Europe. The flowers are pollinated by insects in Europe including bees of the Eucera genus, but little is known about pollinators in the UK except that the occurence of hybrids with other species confirms their presence. 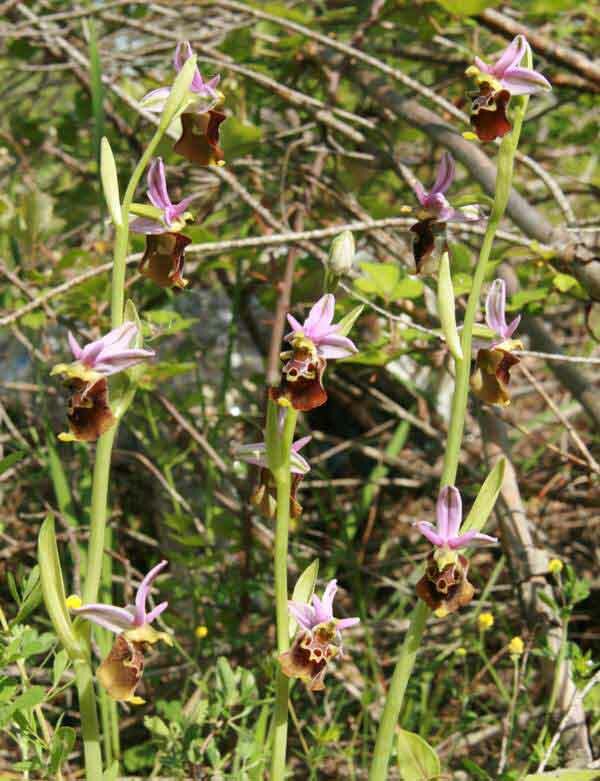 The specimens shown here were photographed close to Monte Sant'Angelo in the Gargano Peninsula in Italy in mid April in very close proximity to many Ophrys sphegodes plants.